REVIEWED: Absolute Batman: The Killing Joke | 'TAIN'T THE MEAT… IT'S THE HUMANITY! 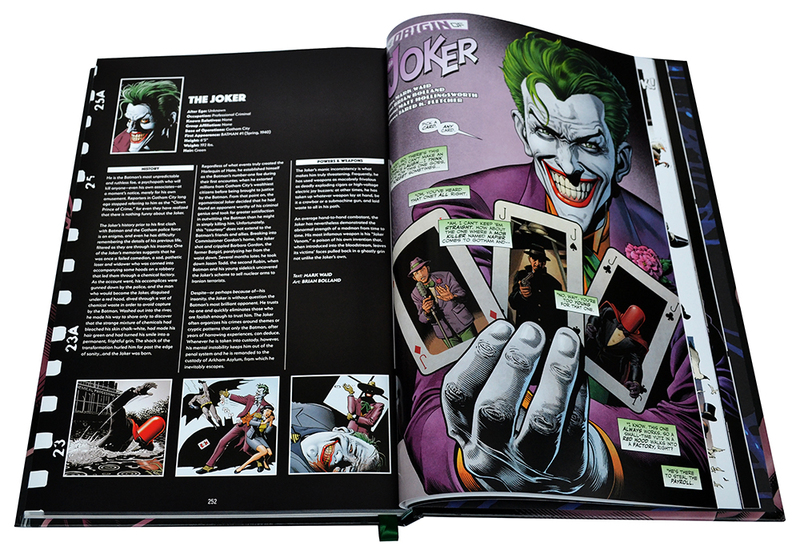 September 2018 saw the release of DC Comics’ Absolute edition of Batman: The Killing Joke. 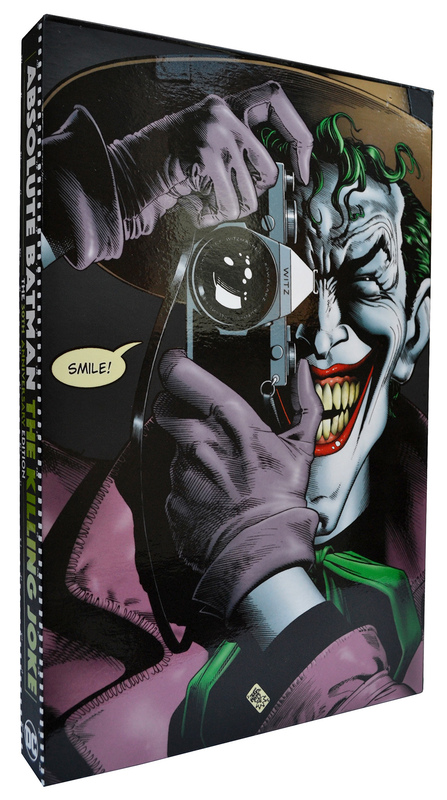 This new collection celebrates the 30th anniversary of writer Alan Moore and artist Brian Bolland’s seminal Batman and Joker story, originally published in 1988. For this review I’m not going to look at the story, but rather at the Absolute edition itself in order to discover if this new prestige format re-release is worth a double — or even triple — dip. I’m also going to take a quick look at the history of DC’s Absolute range of reprints. The fronts covers to both the book and the slipcase. Coming off the huge success of 1986’s genre-redefining Watchmen, which he co-created with artist Dave Gibbons, Alan Moore was given the opportunity to write a much shorter story, this time featuring The Batman, to be published as a prestige one-off graphic novel. The result, Batman: The Killing Joke, became a huge hit, and has rightly taken its place as one of the greatest (if not the greatest) Batman stories ever told. Before we go any further it’s worth taking a quick look at the two previous printed incarnations of Batman: The Killing Joke, as they have a direct influence on this new Absolute edition. All three editions: Absolute (left); 1988 edition (centre) and the Deluxe Edition (right). Originally published in 1988 Batman: The Killing Joke is a short, but incredibly nuanced story that points to the core of Batman and Joker’s relationship. Joker has escaped from Arkham Asylum and, after shooting, and crippling Barbara Gordon, kidnaps her father Commissioner James Gordon in an attempt to drive him insane. Batman rescues the sane, and resilient Gordon before apprehending the Joker. 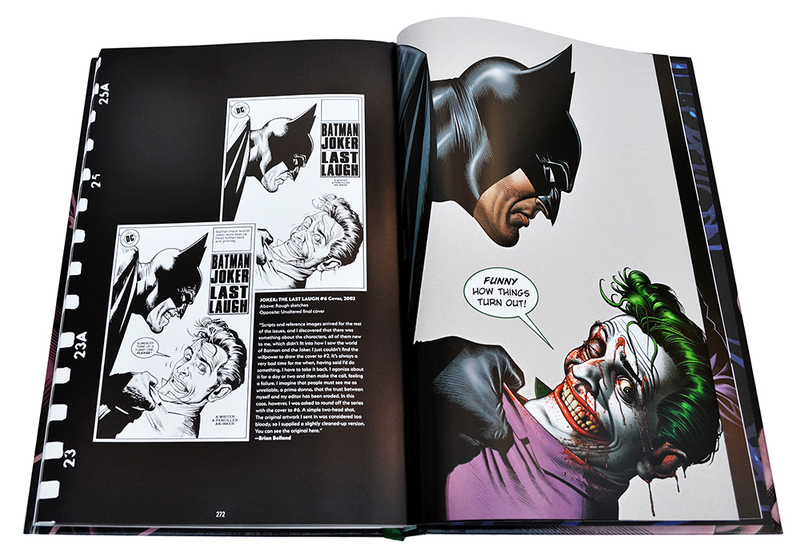 The book is interspersed with flashbacks showing the Joker’s (possible) origin and the book ends on Joker telling Batman a joke that neatly sums up their doomed relationship. The story is a masterpiece of succinct and insightful storytelling, the kind Moore has become famous for. That’s not to downplay Bolland’s wonderfully detailed and fluid artwork though; the artist produced some of the finest work of his career. A sample of Brian Bolland’s recoloured pages (pages 32 and 33). 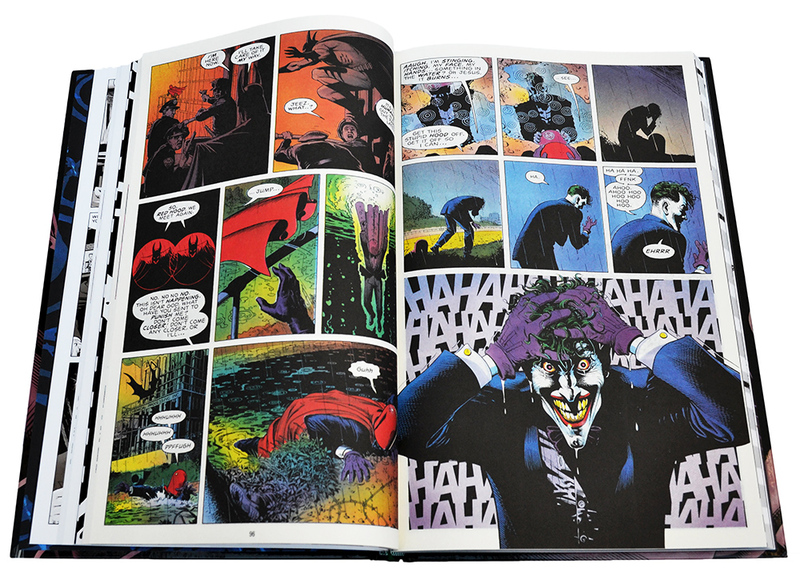 Batman: The Killing Joke was originally released as a 48-page full-colour prestige format graphic novel with cardboard embossed covers. Bolland’s artwork was coloured by John Higgins, who had also also worked on Moore and Gibbons’ Watchmen. Since its original release in 1988 Batman: The Killing Joke has been reprinted 14 times, and for each edition the colour of the logo was changed (the version I own is the fourth edition, or ‘orange’ cover). When the first edition saw print Bolland was reportedly unhappy with Higgins’ work: Higgins’ colours were bold, vibrant and at times somewhat garish, in other words fairly typical of comic books published around that time. However, this colour palette was not what Bolland had imagined when he drew the story — he had envisioned a more natural colour scheme, with the flashback sequences reproduced in sepia tones. John Higgin’s original colour scheme (pages 90 and 91). Compare it with Brian Bollands’ recoloured 2008 version above. 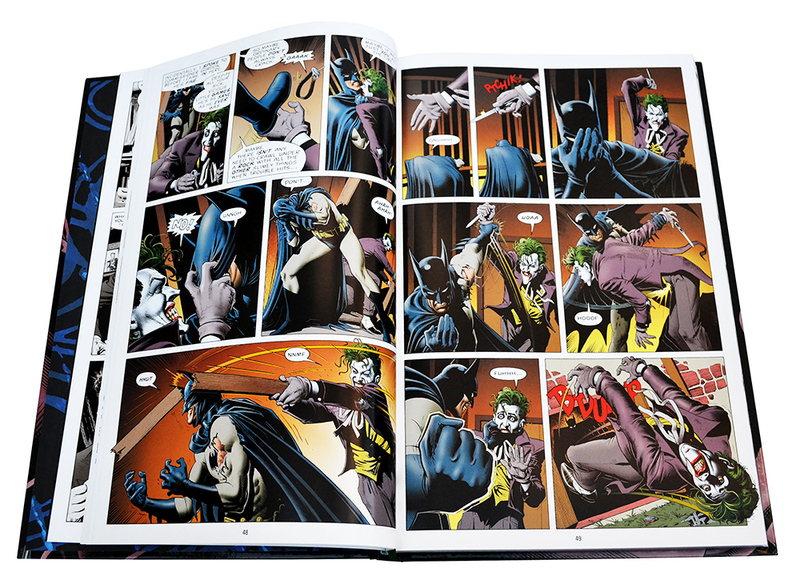 In 2008 Batman: The Killing Joke was re-released as part of DC’s Deluxe range of hardback reprints. 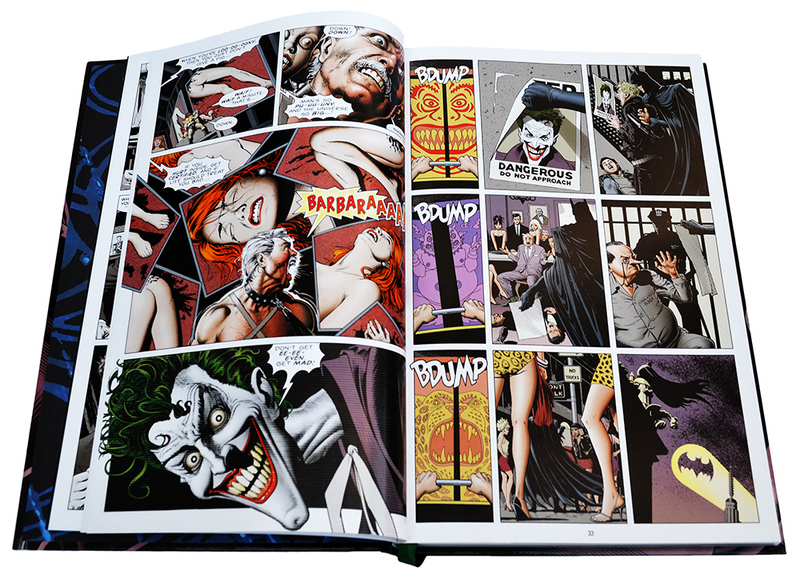 For this 20th anniversary edition Bolland was given the opportunity to re-colour the book more in line with the colour scheme he had originally envisioned. Gone were Higgins’ atmospheric, yet sickly, yellows, greens and pinks, replaced instead with a more natural, realistic palette. This edition also saw Bolland reinstate the sepia flashback sequences. One of the most iconic images of the Joker, now recoloured to reflect to the artists original vision (pages 38 and 39). Which brings us neatly to this new Absolute edition, which reprints both versions of the comic: the original 1988 Higgins coloured version, and Bolland’s re-coloured version from 2008. Before we jump in though, it’s worth just having a quick recap of what DC’s Absolute editions are actually supposed to be about. DC’s Absolute range first saw print in 2002, and were literally meant to be the absolute last word on a particular reprinted story. 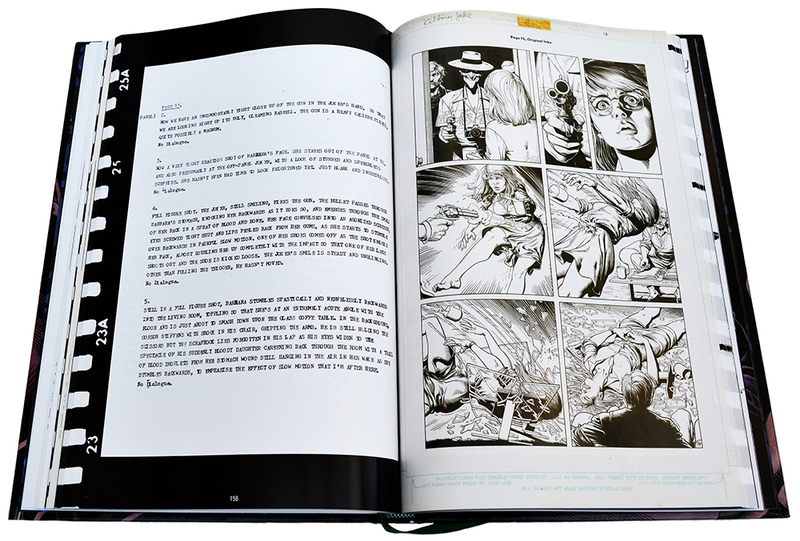 Everything about the Absolute editions is big: the oversized books measure a generous 13 x 9 inches. 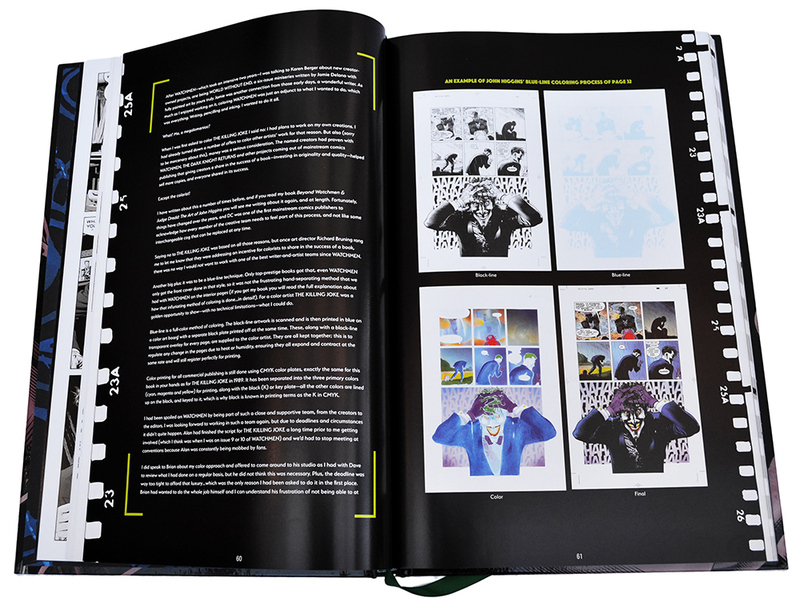 The hardback books come with sturdy cardboard slipcovers, and each edition features new introductions, afterwards, and extras, including artwork and promotional materials. Over the years there have been dozens of Absolute editions, some of which of more satisfying than others. The high watermark is undoubtably the reprints of Neil Gaiman’s The Sandman, which has seen five Absolute editions (not including and Absolute Death spin-off). 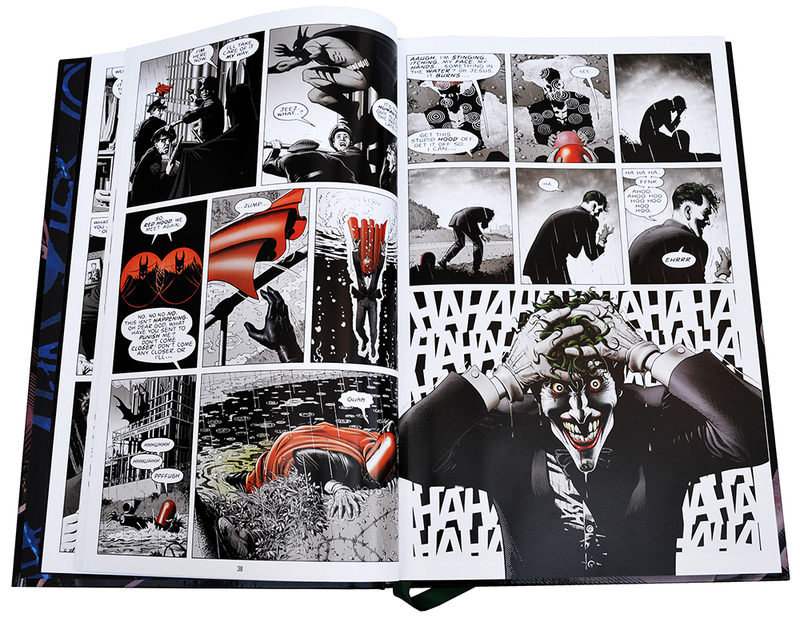 The Sandman editions are gorgeous, printed with fake leather book covers and hundreds of pages worth of extras — they even feature tissue paper endpapers. However, some Absolute editions have been less successful (the bare bones reprints of Alan Moore’s Promethea jump to mind) but on the whole DC’s Absolute editions are what they claim to be: the best reproductions of their best stories. The back cover to the book and the slipcase. So, with all that history done with, let’s take a closer look at Absolute Batman: The Killing Joke. The first thing to discuss is the book’s price: it retails for $49.99 (or £30), which is about half of what the other Absolute editions sell for. 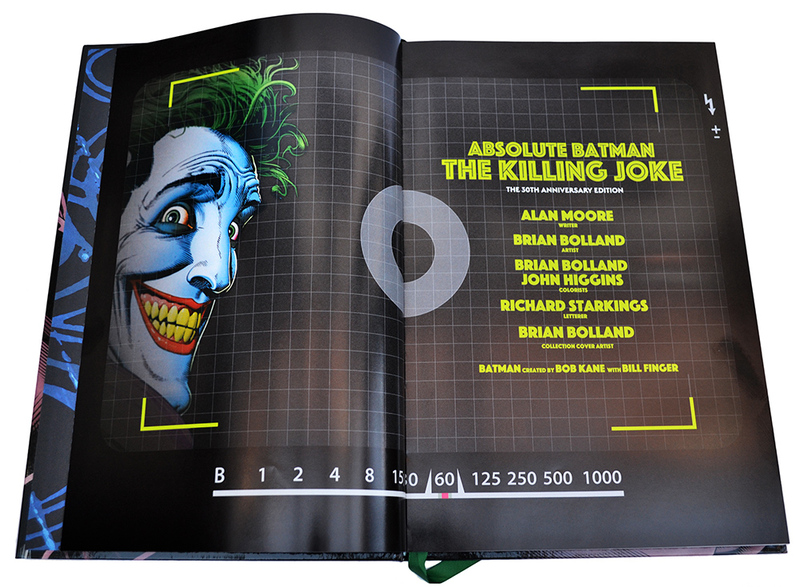 This is hardly surprisingly since, at 286 pages Absolute Batman: The Killing Joke is about half the size of the majority of other Absolute editions (most of which clock in at over 500 pages). I found my edition on Amazon for just £21, which I’ll confess had a big impact on my decision to buy the story for the third time. More of Brian Bolland’s recoloured pages (pages 48 and 49). So first off let’s take a look at the packaging. My copy of Absolute Batman: The Killing Joke came in its own cardboard box, with a label on the front cover describing its contents. Shipping the book in its own packaging is a nice touch and it gives the book an extra layer of protection — indeed the book was in perfect condition once it was taken out of its brown box. 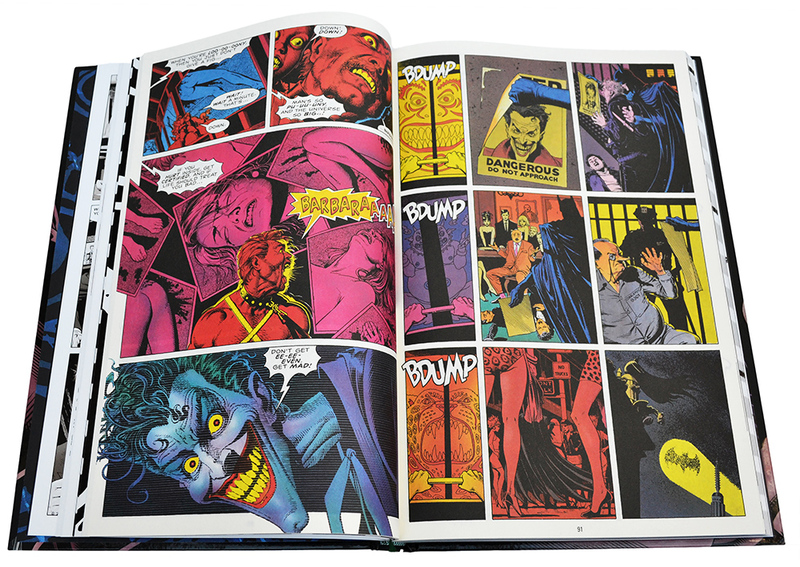 When the book is removed from its packaging we’re greeted with a sight that owners of other DC Absolute books will be familiar with: a thick cardboard slipcase printed in full-colour. 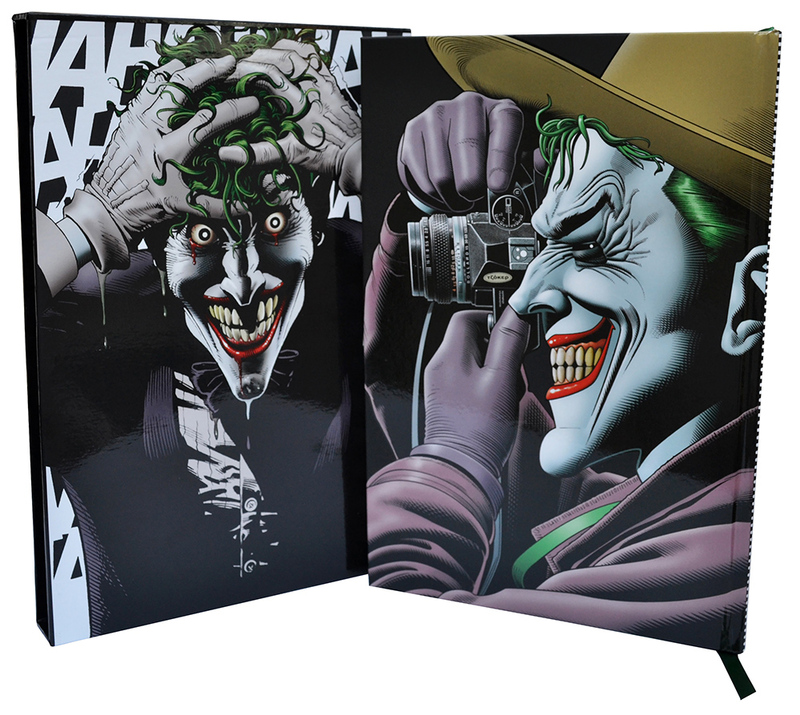 The front and back of this slipcase is adorned with possibly the two most iconic representations of the Joker ever published. 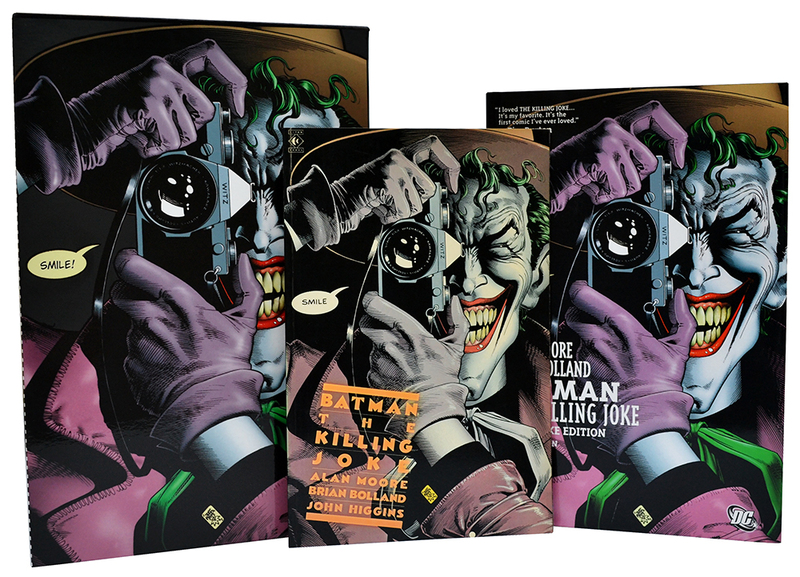 On the front we have the cover to the original 1988 edition of the book, while the back shows the iconic scene from the story where the Joker’s mind snaps and a super-villain is born. The slipcase also features spot varnish on the colour work, which is a nice touch. 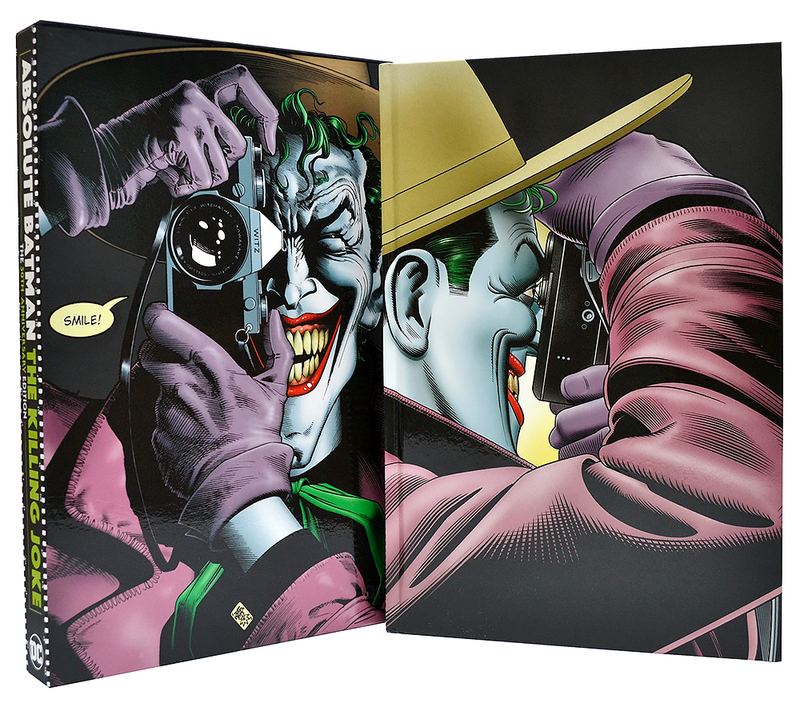 Once the book is taken from the slipcase we’ve met with two new pieces of Bolland artwork commissioned especially for this collection, showing both the left and right hand sides of Joker’s face from the slipcase cover. Finally, the book is printed in full colour on bright white paper stock (apart from one section, which I’ll get to shortly). More of John Higgins’ original colour work from the 1988 edition (pages 74 and 75). Batman: The Killing Joke is just stuffed with content. Kicking off we get an Introduction by artist Tim Sale, reprinted from the 2008 Deluxe edition. We then dive straight into Bolland’s re-coloured version, which is also reprinted from the 20th anniversary Deluxe edition. Bolland’s artwork looks simply gorgeous, enhanced greatly by the Absolute edition’s larger size and the bright white paper stock. Next we get an Afterward by the artist that is also taken from the 2008 Deluxe edition. Next we get some sketches for the original cover, as well as some photographs of Bolland modelling as the Joker for the front cover. 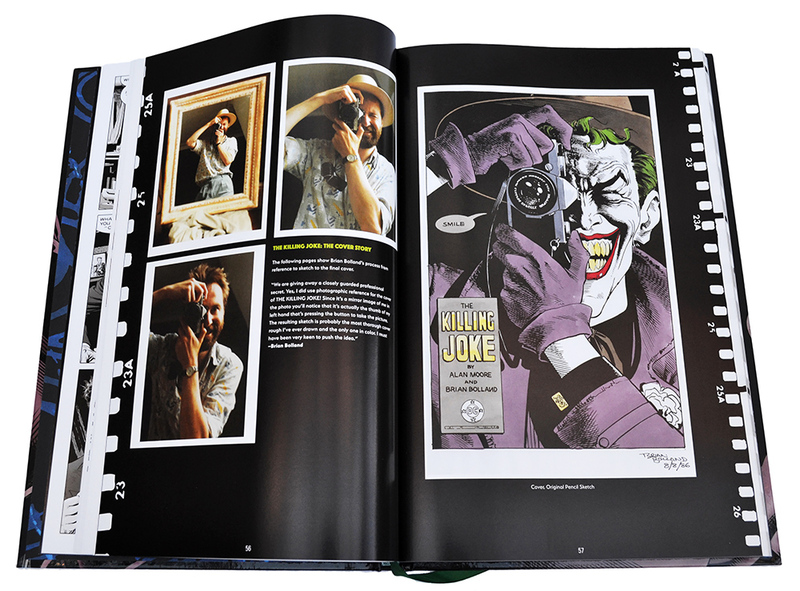 Artist Brian Bolland modelled as the Joker for the book’s cover (page 56 and 57). We then get a new retrospective text commentary by John Higgins, who coloured the original version of the comic published in 1988. Higgins’s discusses his past working relationship with Alan Moore, as well as the technical process behind his original colouring of the comic. 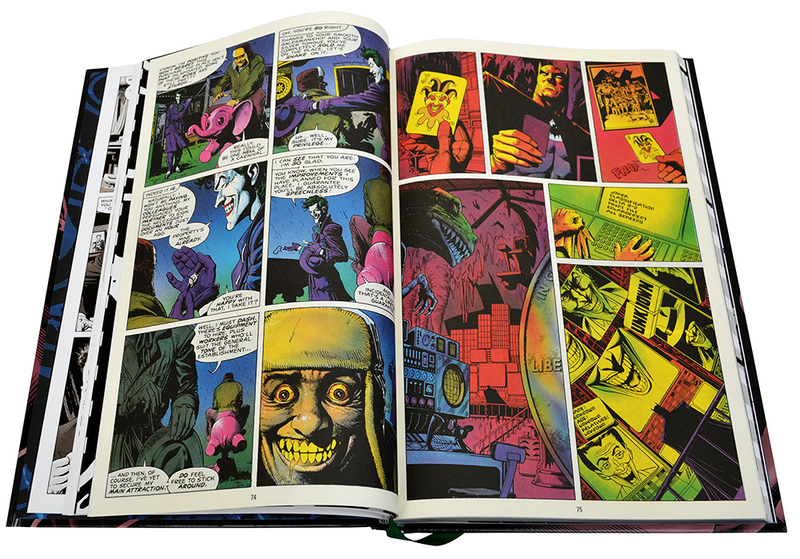 He then confronts, and defends his original colour work, explaining that he coloured the comic from the Joker’s point of view — hence the psychedelic bright, and at times sickly colours scheme. Bolland on the other hand had imagined a colour scheme more from Batman’s perspective, one which would have featured a more natural colour palette. Higgin’s take on the colouring ‘controversy’ is well worth a read and he defends his position very well. John Higgin’s commentary on the 1988 edition’s colour scheme. Next up we get a reproduction of the 1988 comic, along with the original colour scheme. What’s interesting in this section is that it’s printed on paper stock similar to that of the original 1988 comic. This is a really nice touch by DC and one I haven’t seen used in Absolute editions that much before. Reproducing both versions of the comic is a bold, yet understandable decision by DC, as it allows fans to compare both versions directly. Personally, I like them both. Sure, Bolland’s colour work is more subtle and realistic but Higgin’s sickly colour palette goes more to the Joker’s state of mind, and it works well in its own right. More of John Higgins’ original 1988 colouring (page 96 and 97). After this second reprint we get Alan Moore’s full typewritten script for the entire comic, which runs from page 116 to page 250 (over 130 pages, almost three times the length of the actual comic). Moore is well known in the comic book industry for providing incredibly detailed scripts where every panel is described in fantastic detail — sometimes he’ll spend an entire page describing just one panel of the story. It’s fascinating to see how Moore worked, and we see at first hand that his reputation for being meticulous is well-deserved. A sample of Alan Moore’s script, as well as Brian Bolland’s original pencil artwork (pages 158 and 159). After Moore’s script we get a reproduction from The Origin of The Joker, which is reprinted from Who’s Who in the DC Universe, issue #30. After that we get a reprint of An Innocent Guy, a story written, illustrated and coloured by Bolland, taken from Batman: Black and White #4, along with an art gallery of other DC character’s illustrated by Bolland. (Bolland fans who want to see more of his work should check out my review of The Art of Brian Bolland). The book ends with full page biographies of Moore, Bolland and Higgins. Finally, I should mention that in line with all of DC’s other Absolute editions this book comes with a bookmark ribbon, a nice touch that helps gives the Absolute books a classy feel. So the question remains: is Absolute Batman: The Killing Joke worth a double, or even triple dip? My answer is ‘yes’, although a great deal of that decision is due to the book’s price. I paid £21 for my version and that’s about as much as I’d want to pay bearing in mind I already own the other two editions of the story. For someone who doesn’t own any previous incarnation of the book then I would certainly recommend buying the Absolute edition, it really is the best reproduction of the story to date. If, like me, you already own either, or both of the previous editions then the Absolute version is still worth a go as it’s a beautifully presented book, and comprehensive in its coverage of this seminal comic book story. The volume ends with an art gallery of Bolland’s DC work (pages 272 and 273). Batman: The Killing Joke is simply one of the best Batman stories ever committed to paper, told by two creative giants at the height of their powers. For die-hard fans of Moore and Bolland’s story this Absolute edition is a must — and at £21 its a downright steal. For even casual comic books fans — or anyone just wanting a damn fine read — then this edition is well worth a go; you’d be insane not to give it a try.